Find your hauler information and garbage collection day. Subscription Service ($120 per year): You can set out a yard waste cart and up to 8 compostable bags to be collected each week. If you set out more than 8 compostable bags, you will be charged $3 for each additional bag. The $120 fee is an annual flat rate and is not pro-rated based on the start/end of service. Contact your hauler now to set up service and get a yard waste cart. Non-Subscription Service ($3 per bag/bundle): You can set out a compostable bag or bundle of yard waste beside your garbage cart. Call your hauler at least 48 hours before your regular garbage collection day to request this service. Your hauler will tell you which day to set your compostable bag(s) or bundle(s) out for collection. Yard waste bags or bundles cannot exceed 40 pounds or two feet in diameter and three feet in length. Tree stumps, dirt, and/or rocks are not allowed in yard waste collection. Please do not place yard waste inside your garbage cart. Learn more about yard waste service by visiting our yard waste page. You must call your hauler to get yard waste started. Yard waste service is not automatically renewed--if you had subscription yard waste service in 2018, you will still need to renew your yard waste subscription service for 2019. St. Paul residents can also drop off yard waste at any of the Ramsey County yard waste sites. 4/4/19: Ken Berquist & Son Disposal announces the sale of its residential business to Waste Management effective April 1, 2019. Ken Berquist & Son Disposal has always been committed to providing their customers with the best service possible and is confident that Waste Management will continue to provide the same level of satisfaction moving forward. The service level provided, quarterly charge for service, and collection day will not change. Because of the timing of the sale, previous Ken Berquist & Son Disposal customers will see an adjustment to their billing cycle for Quarter 2 2019 (April - June). Waste Management will mail out these bills during or prior to the week of Monday, April 29th. The due date will be on Monday, May 20th. Waste Management looks forward to providing our customers with a high level of service in the future. if you have any questions on your account during the transition, please call Waste Management at 763-784-8349. Click here to read the letter from Ken Berquist & Son Disposal and Waste Management. If a quarterly garbage bill is not paid in full after 90 days from its issue date, the remaining balance of that quarter’s bill, including any late fees that were added, is turned over to the City for assessment. Once the balance is turned over to the City, the garbage hauler cannot take payment for that quarter. If a property owner wishes to pay the garbage bill before it is finally assessed to the property, they must pay the City of Saint Paul Assessments office. If the City of Saint Paul Assessments office does not receive payment for the outstanding garbage bill, the bill will be sent to Ramsey County to be assessed to the property. When a bill is assessed to the property by Ramsey County, it will incur additional administrative fees. The City of Saint Paul Assessment office will send out delinquent account notices to property owners. The notice will contain the outstanding amount due and the final notice of delinquent charges. The notice will include the due date (30 days from the issue date) and a brief description of the charges due. Residents can pay their bill before it’s assessed to the property so it does not incur additional charges. Payment can be made with check (checks should be made out to the City of Saint Paul) or credit card at the assessments website or by mail. Please send mail payment to the following address (checks should be made out to the City of Saint Paul). The delinquent account notice will include the dispute process for property owners who believe they were charged in error. Property owners must have documentation of the billing error and must fill out the webform provided in the notice. If the City of Saint Paul Assessment office does not receive payment for the delinquent charges by the due date, the City will send a second notice out mid-March. This letter will notify the property owner that any outstanding charges are going to be assessed to the property. The letter will also detail the dispute process. Residents must respond via Webform if they dispute the charges. Residents must list the issue with the delinquent charge and may be required to provide documentation of the dispute. The webforms will be reviewed by Public Works staff. If Public Works staff determine that the delinquent charges were billed in error, they will resolve the issue with the resident. If Public Works staff are unable to determine if the delinquent charges were billed in error, those disputes will have a legislative hearing scheduled. A recommendation on the validity of the assessment will be provided to the City Council for their approval of the final assessment roll. The approved assessment roll will be sent to Ramsey County for inclusion on the property tax statement. If property owners have general questions about the assessment process, they can contact the assessment department at 651-266-8858. Starting January 2, 2019, property owners can change their garbage carts to a different size. Please contact your hauler directly to schedule a cart change. Due to an expected high volume of cart changes, it may take more than two weeks for the cart change to occur. Property owners should pay their current bill and any price adjustments from the cart size change will be applied on their next invoice. You will continue to receive quarterly statements (every three months); however the invoices will now be mailed the 5th day of the first month of quarterly service, not the original timing of the 20th day of the month prior. In 2019, property owners should see their quarterly garbage bills in January, April, July, and October. The new bills will be due the 25th of the billing month. We are aware that some garbage haulers have sent out notices of non-payment and attached late fees to residents who paid their bills in October. We apologize for the inconvenience that this has caused our residents. In each case where an individual hauler received full payment for trash collection from a residence before October 31, the hauler will remove any late charge for the month of October 2018 from the account balance for that residence. Each affected resident will receive a letter from their hauler confirming this change. If a resident paid their bill in full, got the notice of nonpayment, and paid the late fee, they will receive a credit on their next billing invoice. If a hauler received full or partial payment for trash collection after October 31, or not at all, the late charge for October will remain on the account balance. The City and each hauler will jointly review complaints received to ensure compliance with this procedure. Residents must still pay their garbage bill to avoid the additional late fees. 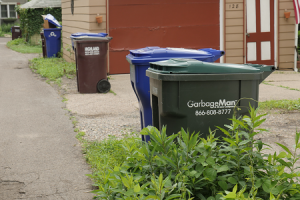 If the bill is not paid in full by the end of the quarter, the city will place the outstanding garbage service and late fees on the property owner’s Ramsey County property taxes at the end of the year. The 2018 Yard Waste service season has ended as of Friday, November 30. Learn more about 2019 Yard Waste service options here. If you previously had Yard Waste service, please store your yard waste cart in a safe and secure location. Check back on this page for further instructions on the yard waste cart removal process. If your garbage cart was set out at your collection location by 6:00 a.m. on your collection day and your garbage was not collected, please call your hauler immediately to report a missed collection. Find your hauler’s contact information by using our interactive map. If you did not put your garbage cart out properly by 6:00 a.m. on your collection day, your can request for your hauler to return and collect your garbage for a $40 fee, plus tax. If you would like to request “return service,” call your hauler directly. Find your hauler’s contact information here. Billing services are provided by your designated hauler. If you have any questions about your bill or you believe that there may be an error on your billing statement, please contact your garbage hauler directly. You can find contact information on the invoice you received from your hauler or by using our interactive map. Old garbage carts* continue to be removed by the garbage haulers. Please keep your empty old cart at your collection location for removal. If your old garbage cart has not yet been removed, call your previous garbage hauler to notify them that their cart is still at the property. They will coordinate with you to remove the old garbage cart. Please make sure your old cart is empty and at your normal garbage collection location. If you’re able, place the old cart upside down to prevent garbage from being placed in it. Depending on the condition of the carts, garbage haulers will re-purpose the cart in different cities they serve, use them as yard waste carts, recycle them, or properly dispose of them. *NOTE: this process is only for hauler-owned carts. If your old cart or garbage container was purchased by you (such as at a retail or hardware store), it is yours and will not be removed through this process. No longer want the garbage container you own? Give it away to a friend or neighbor, post it online at Twin Cities Free Market for someone else to reuse, or dispose of it at a transfer station or as your free bulky item. If you have a 35-gallon “small” garbage cart with a purple lid for the Saint Paul Citywide Garbage Service, your garbage will be collected every other week. Please refer to the link below to download the 2019 Every Other Week Collection Schedule. Find out which day of the week your garbage is collected by visiting stpaul.gov/garbagemap. 9/26/18: We are aware that R&M Sanitation has decided to turn their Saint Paul customers over to Republic Services. Your collection day will remain the same day of the week as was initially assigned. Find your collection day here. This only pertains to Saint Paul residents that were initially informed that R&M Sanitation would be your new hauler. Click here to read the letter from Republic Services. 9/22/18: We are aware that Krupenny & Sons Disposal has decided to turn their Saint Paul customers over to Highland Sanitation. Your collection day will remain the same day of the week as was initially assigned. Find your collection day here. This only pertains to Saint Paul residents that were initially informed that Krupenny & Sons Disposal would be your new hauler. Click here to read the letter from Highland Sanitation. 9/17/18: We are aware that Triangle Rubbish Service has decided to turn their Saint Paul customers over to Highland Sanitation. Your collection day will remain the same day, on Tuesday. This only pertains to west side Saint Paul residents that were initially informed that Triangle Service would be your new hauler. Click here to read the letter from Highland Sanitation.